The following blog was originally published on my writing blog, ZenBagLady, two years ago. After talking to my sister Debbie yesterday and with the weather being so sunny and warm today, I started reminiscing about our summer vacations. Besides, I just don’t feel like writing about anything related to weight today, and there’s no rule that says I have to, right? Camping season is around the corner and vacationers will soon take to the roads in their RVs or lugging their fancy fifth wheels or pop-ups, destined for state parks or festivals or some relative’s driveway. When I was a kid, my family went camping, too, only we didn’t have brand-name digs. We had The Bear Coffin. Dad bought this little homemade gem in the late ‘60s. It was built on a 1953 Buick suspension and it folded out on opposite sides to sleep four. There was a cookstove and water faucet up front and the only luxury was the little toilet that let us avoid middle-of-the-night runs to the campground bathrooms. This was particularly beneficial during fish fly season. Originally aqua colored, Dad painted it the same color gold as our living room and added a roll-out tarp above the door. My brother recently inherited that partially filled can of 40-year-old Supermix gold paint when Dad downsized his garage, but Dad kept the tarp. Nothing goes to waste in my family. It was probably my mother who dubbed it The Bear Coffin. When it was folded down, its half-circle top and flat bottom was certainly large enough to hold a bear. It caused a lot of rubbernecking as we drove down the highway and it was always the talk of any campground we set up in. 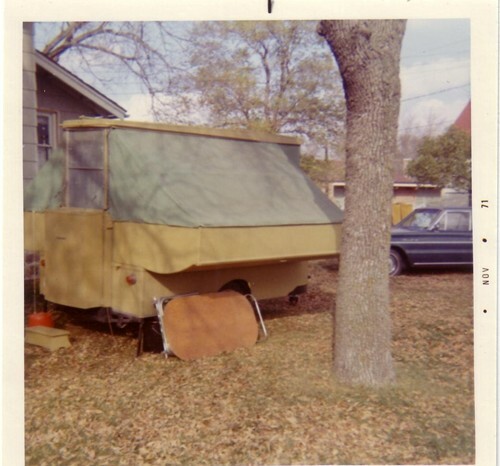 While the camper accommodated four people comfortably, there were usually five or more of us on any given trip. This meant that the leftover people either had to take their chances that they wouldn’t get stepped on (or if I was in a berth, plopped on – I fell out of bed all the time) if they slept on the floor between the berths, or they bedded down in the Chevy station wagon, which is what my sister and I had to do on one of our family vacations to The Black Hills in South Dakota. Being 15, Debbie got the back seat and I, not quite 8 at the time, was stuck in the front seat with my pillow on the passenger seat and my legs carefully tucked below the steering wheel. We were covered in mosquito repellant because the windows were rolled down, but the crickets chirped and the stars were bright and my sister taught me camping songs and told me stories. Debbie was always kind to me, even when I stole her crutches after she’d injured her foot and after she busted me tape recording her and her boyfriend’s private conversation. She was politically active and tried explaining Vietnam and Watergate to me even though I was more interested in watching Captain Kangaroo and hanging upside down from our backyard elm tree. Mom often made us matching clothes, and during that trip to South Dakota, we both wore what I called our Wonder Woman shorts. 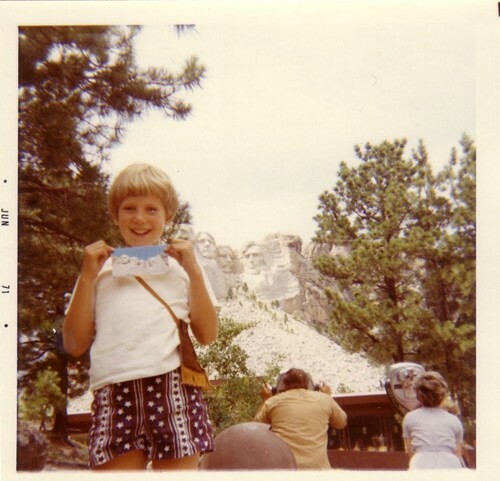 They had white stars on blue and purple stripes and I remember being jealous of my beautiful sister who was tall and thin and filled out her shorts in a way my 8-year-old body could not (and never did, for that matter). Being it was summer and we camped on the Great Plains, thunderstorms were common, usually in the evenings around the cocktail hour. Dad loved Scotch on the rocks and what better way to obtain “rocks” in nature than by reaching his glass beyond the tarp to catch hail stones as they fell. The Bear Coffin’s canvas was sensitive to rain and Dad told us that there was a chance it could leak during a storm, particularly if someone touched it. That’s not what I heard, though. What I heard was, “Don’t ever under any circumstances touch the canvas when it’s raining because a flood as big as Noah’s will come and sweep you away and you’ll never see your family again.” My little brother knew this was my fear, so when it rained, he’d make sure I was watching and put his finger a breath away from the canvas. In horror I’d scream, “Stop it! Don’t touch the Kansas!” Of course I meant “canvas,” but I didn’t hear the “v” sound when dad said the word, and being the sensitive people they are, no one in my family has let me forget that. We went a lot of places with The Bear Coffin, places everyone should see once in their life – Lake Itasca and the mouth of the Mississippi; Wounded Knee, where we visited a Native American school my mom and her green stamps helped buy a school bus for; the Badlands, where Mom said a tree probably grew where I peed, perched between the opened front and back doors of the station wagon; Wall Drug; Hot Springs; and Devil’s Tower. And while it’s been 35 years since we took it camping, I can still remember how the door sounded when it was opened and closed. At the end of the night, I’d lie in bed and listen to Mom and Dad outside talking to other campers, then they’d come in to sleep and when Dad shut the door it sounded like the sucking sound of a hatch of a space ship, sealing us in a happy, warm pod. My towhead brother and me at Flintstone Park. There are several photos in the album of the two of us sitting on various cartoon dinosaurs, and of course, us in the face cutouts of Wilma and Fred’s bodies. 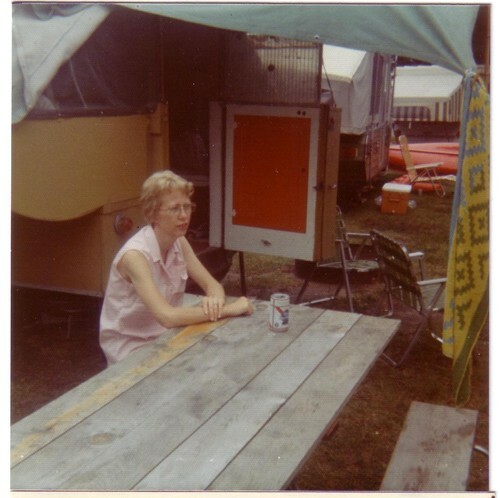 My skinny mother looking very exited to be sitting outside the Bear Coffin and drinking a Pabst Blue Ribbon. An even better view of the Bear Coffin because it also features the family station wagon. This entry was posted in Uncategorized on March 15, 2009 by Lynn Haraldson. OMG this is a fantastic post! I wish I had access to childhood photos, I’d copy your idea like mad! Love it! Oh boy, those date-stamped snapshots bring back memories. So does your hairdo, dear. We might have passed for (dorky) sisters.~Shelley S.
great memories you have there. i love your wonder woman short! Lynn, what a great story I smiled the whole time reading it. Reminded me of when I would go with my aunt, uncle and cousin in their camper. My aunt would make us matching clothes too in those wonderful 70’s styles lol. I loved wonder woman lol. 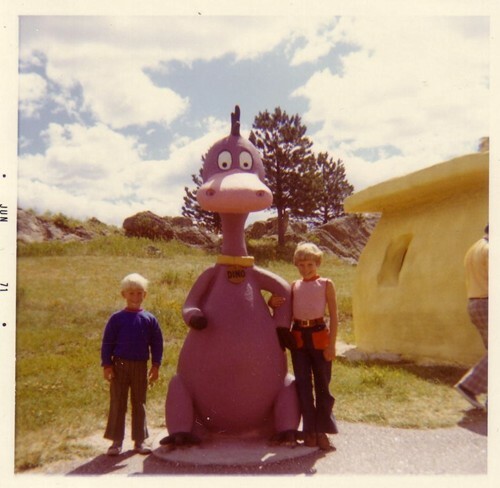 We went to Flintstone park around 1966. I love that camper you had! That is beyond cool! That was great! 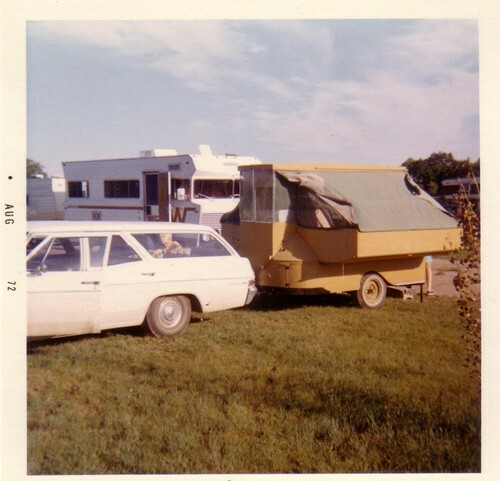 I liked the last picture of the station wagon and a better picture of the ‘trailer.’ Looked like you guys had a lot of fun!